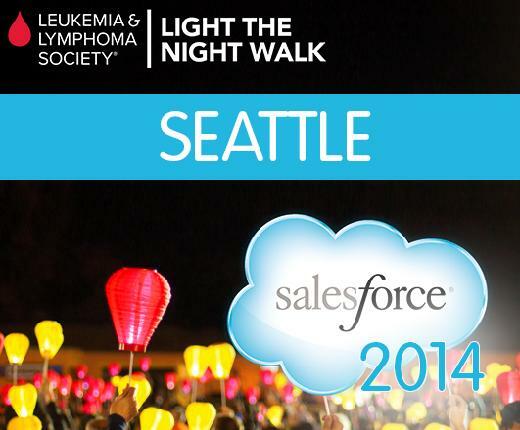 We are part of the national Salesforce.com Light The Night Walk team. Last year, in Salesforce.com's second year as a national walk team, employees across North America raised an incredible $260,000 bringing our overall impact to $450,000!! to help END blood cancers. This year, our goal is to raise $300,000 - help us do our part in Seattle by joining our local team today! If you walked last year: email Sabrina.Thatcher@lls.org and they will register you for the upcoming walk. This will allow you to have access to all of your information from last year. If you did not walk last year: scroll down and click on the red JOIN button next to your team. Thank you for your support! Let's Walk to the End of Cancer! Need help? Want to plan a fundraising event or host a kickoff? Please contact your local LLS staff partner, Sabrina Thatcher and Sabrina.Thatcher@lls.org.